Imagine being an interpreter of dreams in ancient Egypt. What was the daily grind like for the ancient Egyptians? Imagine it's your job to carve elaborate tombs out of rock formations (it will take years to do) or man an army outpost in the extreme heat of the desert. You might have worked transporting some of the over 2 million stones for the Great Pyramid or engineered irrigation projects along the Nile. 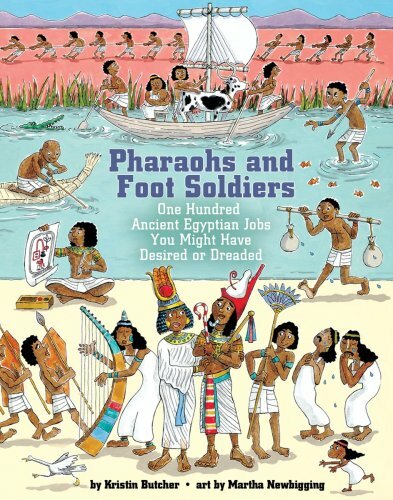 Pharaohs and Foot Soldiers offers an innovative look at the jobs that kept Ancient Egypt running for 3,000 years. Among the 100 careers profiled you'll also find reed cutters (who worked naked), sandal makers (many went barefoot) and even embalmers (pulling out organs took special training). Whether prestigious or poor, Egyptians had to be tough, trustworthy, stealthy and skilled to get by. Complete with a fact-filled introduction, a comprehensive timeline and playful illustrations throughout, Pharaohs and Foot Soldiers will inspire readers to imagine how they may have lived out their days as a member of one of history's most fascinating civilizations.